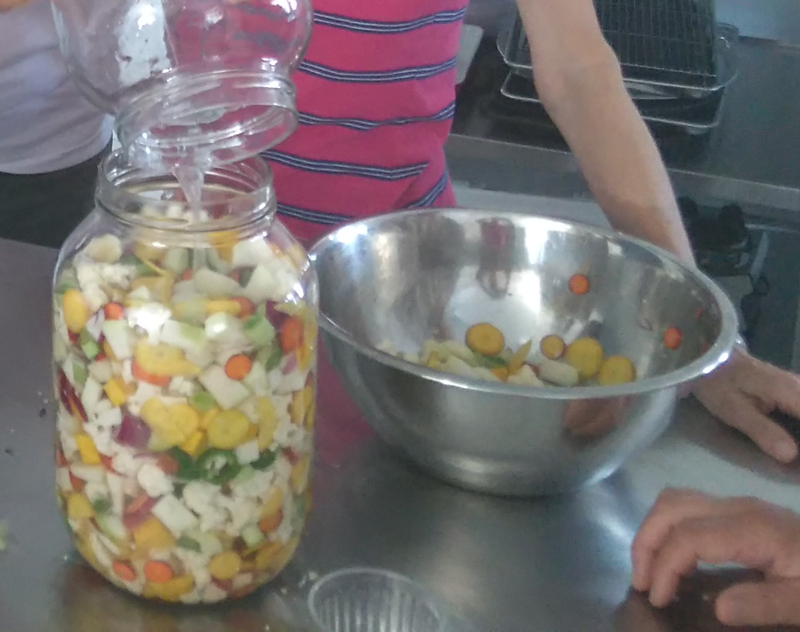 On September 17, 2017 Earth Haven Farm and Learning Centre hosted a hands-on workshop on fermentation basics presented by Lorraine Schmid. With a background in nutrition, Lorraine owns and operates Thyme Again Gardens, an organic farm and Bed and Breakfast in Prince Edward County. For the past several years she has been experimenting with ferments made from all sorts of veggies. She began her talk with an introduction to the health benefits of ferments. Not only do probiotics found in fermented vegetables help with digestion in the gut, they also contribute to overall bowel health, increase levels of certain B vitamins and vitamin K and assist in the detoxification of unwanted substances. Those people who eat well balanced meals including daily doses of ferments tend to be less depressed and more mentally alert. She pointed out that pickling veggies in vinegar does not have the same benefits as fermentation. No oxygen. Fermentation takes place in an anaerobic environment. One must press out all the air in the glass container and keep the veggies under the brine. Prepare the veggies as soon as possible after harvest. This way they have more moisture content than if they were stored for several days after being harvested. The brine must be at room temperature. The cooler the temperature, the slower the fermentation process. Tasting the ferment throughout the process helps determine when it is complete. The more sour the better. Reverse osmosis or filtered water makes a better ferment. Chlorinated water kills the probiotics. Unrefined sea salt is recommended as it is full of minerals and supports probiotic bacteria. Organic or biodynamic produce is preferred. Herbicides kill the good bacteria that contribute to the fermentation process. Thin skinned carrots do not need to be peeled. When fermenting veggies, keep them out of direct sunlight. After this brief introduction, we then proceeded into the kitchen and started chopping up veggies and placing them (“massaging”) in a room temperature brine at the work stations. This practical hand-on session gave participants the confidence and knowledge needed to make their own ferments at home. Lorraine also demonstrated how to make Kombucha from a starter ferment called “Scoby” and Earl Grey black tea. The word scoby is an acronym for Symbiotic Culture of Bacteria and Yeast. From a biodynamic perspective, Lorraine Schmid shared how it is better to make ferments when the moon is waning and in a fire sign, both of which occurred on that particular day. She always notes this lunar information on her labels together with the list of ingredients so she can better track the outcomes. Another suggestion she shared is to undertake fermentation tasks with a happy disposition and not be in a rush. “Putting lots of love in what you do every day helps set the intention for a positive outcome,” she added."